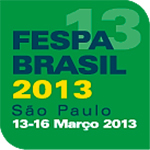 We are pleased to announce that we will now be exhibiting at FESPA Brasil 2013. The show will run from 13th 16th March 2013. It will be taking place at the Expo Center Norte - Blue Pavillion in São Paulo, Brazil. For more information on the show please visit FESPA Brasil (English Version). Alternatively, please click the show logo below.